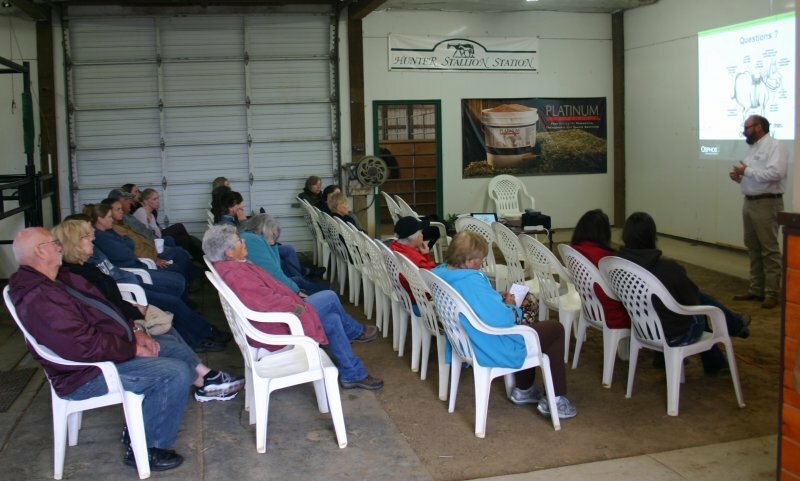 Hunter Stallion Station was pleased to host the Annual Horseman’s Day at the HSS Equine Veterinary Clinic in Wilton, CA. 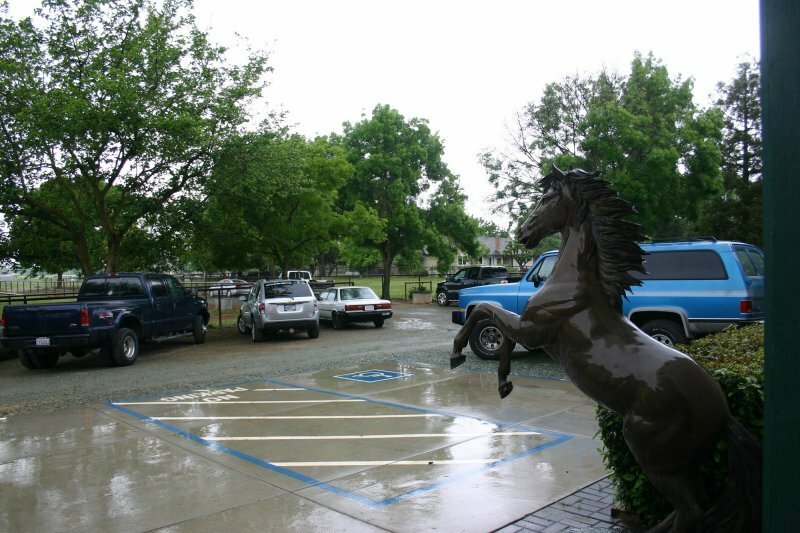 This year, the rain did not keep horse owners from attending Horseman’s Day where the focus was on the impact of ulcers and lameness on horses. Dr. Joe Manning covered the topic of lameness, including prevention, diagnosis, treatment and control. Whether your horse is heading for the show ring this summer, hitting the trails, or enjoying retirement in the pasture, this information was very useful for owners seeking to keep their horse happy and healthy. Dr. Kristen Philpott covered the signs of ulcers, possible causes, and how to detect them. 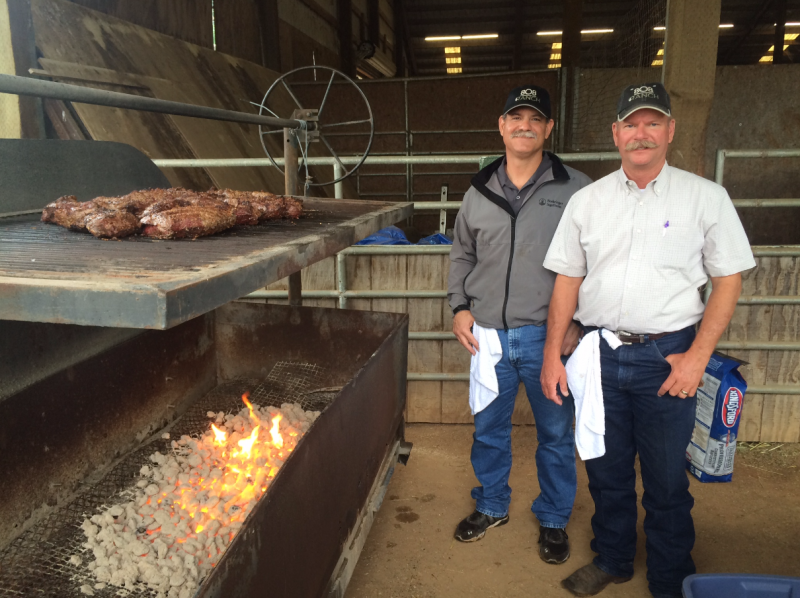 Following the lectures, guests enjoyed a tri-tip barbecue lunch and mingling with fellow horse lovers. 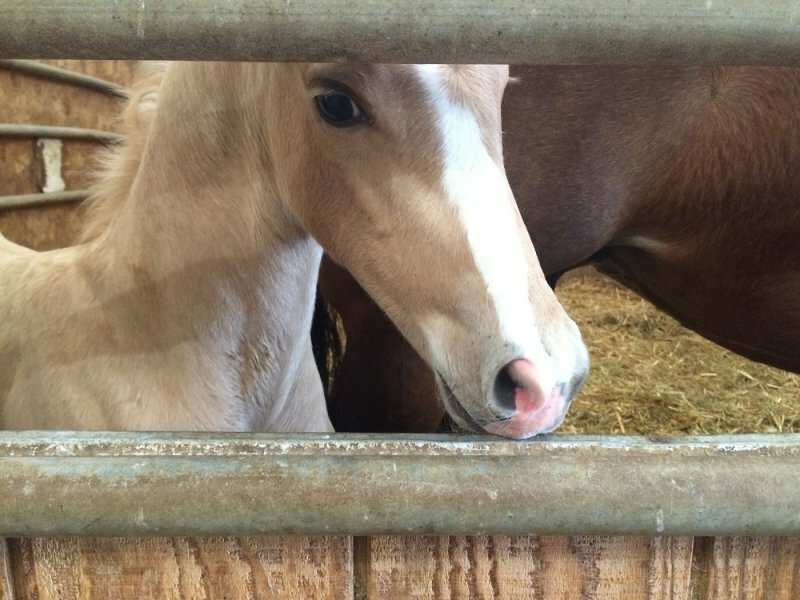 They were also able to stroll through the barn and view some brand new foals! Enjoy the pictures from Horseman’s Day. Other cases have been reported in Riverside, Santa Cruz and Monterey counties. Click here for more details on these cases. The 13 year old Quarter Horse mare resides in San Joaquin County and tested positive for the neuropathogenic strain of EHV-1. She did not attend Mule Days in Bishop, CA from May 17-26, 2015 but was exposed to two cohort mules after they arrived home from Mule Days. The mules were asymptomatic for EHV-1. The Quarter Horse mare exhibited symptoms compatible with EHV-1 beginning on June 5th including lethargy, fever, stocking up of her hind limbs and severe lack of coordination in her hind limbs. The mare was euthanized on June 14th. The affected premises are home to 10 horses and mules and at this time there are no other affected equids (horses, donkeys or mules) on this property. The owner has been monitoring temperatures 2 times per day on all of the horses and mules. This mare had not received any EHV-1 vaccinations in the past two years. This location is under CDFA quarantine. Equids diagnosed with the neuropathogenic strain of EHV-1 are much more likely to develop neurologic signs than those equids diagnosed with the non-neuropathogenic strain of EHV-1. By definition, equids infected with EHV-1 that develop neurologic signs are considered EHM cases. EHM is considered a reportable disease in California and must be reported to regulatory officials within 48 hours. An investigation has been initiated and owners with potentially exposed horses will be contacted. Owners of exposed horses are asked to monitor their horses for clinical signs and take temperatures twice daily. CDFA will continue to monitor the situation. 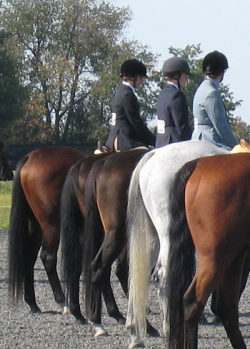 CDFA reminds horse owners traveling with horses to participate in an equine event, that there is always disease risk when horses of unknown health status are commingled for a show or competition. CDFA strongly recommends that horse owners practice proper biosecurity when attending an equine event. Compliance with basic biosecurity practices is an important factor in reducing risk of exposure to all contagious equine diseases. Avoid use of communal water sources. Avoid sharing of equipment unless thoroughly cleaned and disinfected between uses. Monitor your horse for clinical signs of disease and report any temperature over 102°F to a veterinarian. Read our recent blog for more information on this virus and learn how you can take preventative measures. If you are concerned your horse may have been exposed to EHM, contact Hunter Stallion Station (916) 687-6870, or your equine veterinarian immediately. Please share this message with other horse owners to help prevent further spread of the virus. 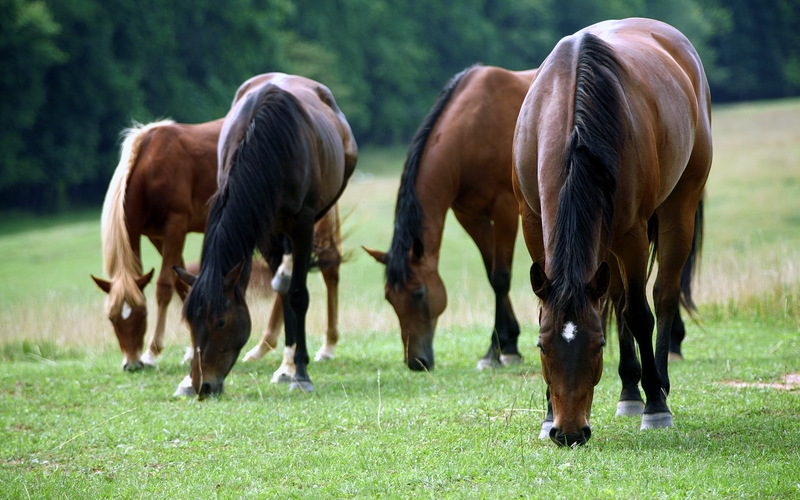 A recent case of Equine Herpesvirus Myeloencephalopathy has been confirmed in California. EHV-1 can cause four manifestations of disease in horses, including neurological form, respiratory disease, abortion and neonatal death. It is important to learn the signs of this virus, and to take precautions to protect your horses. Signs of EHV-1: fever, nasal discharge, hind end weakness, diminished tail tone, lethargy, urine dribbling, head tilt, leaning against a fence or wall to maintain balance, and inability to rise. According to the American Association of Equine Practitioners (AAEP), after infection, the incubation period may be as short as 24 hours, but is typically 4-6 days, and can be longer. EHV-1 typically causes a two-phase fever peaking on day 1 or 2 and again on day 6 or 7. With respiratory infections there is often serous or mucoid nasal and ocular discharge, but not a lot of coughing. There may be some persistent enlargement of lymph nodes under the jaw. With the neurologic form there are typically minimal respiratory signs, with fever (rectal temperature greater than 102 degrees F) being the only warning sign. Neurologic disease appears suddenly and is usually rapidly progressing, reaching its peak intensity within 24 to 48 hours from onset of neurologic signs. Your horse has been exposed if it has been in close contact with a confirmed case of the Equine Herpes Virus (EHV-1) within the last 14 days. May 21, 2015 : A seven year old barrel racing Quarter Horse gelding, originating from San Luis Obispo County, displaying mild hind limb ataxia was confirmed positive for the non-neuropathogenic strain of Equine Herpesvirus-1. This strain of virus is responsible for the more common rhinopneumonitis cases. 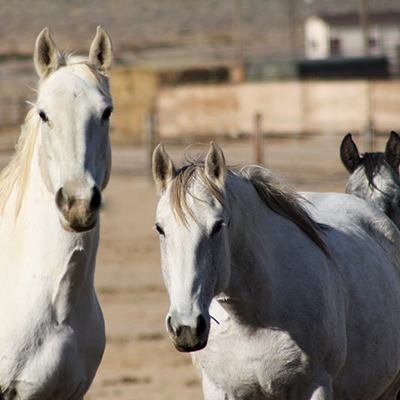 A small percentage of the non-neuropathogenic infected horses can display neurologic signs compatible with equine herpes myeloencephalopathy which is a reportable disease in California. The quarantined gelding is under veterinary care in Santa Barbara County and is recovering. An investigation has been initiated and owners with potentially exposed horses will be contacted. Owners of exposed horses are asked to monitor their horses for clinical signs and take temperatures twice daily. The California Department of Food & Agriculture (CDFA) will continue to monitor the situation. Pigeon Fever (also called dryland distemper) has spread across North America and should be a concern for every horse owner. As the West enters another serious drought season, this disease becomes even more prevalent as it thrives in dry soil. Fortunately, there are preventive measures that can be taken to decrease the chances your herd will be impacted by this painful and sometimes fatal disease. Pigeon Fever is a serious infection found in horses. It got its name from the resemblance to a pigeon’s swollen breast. This soil-borne organism is thought to be transferred through open abrasions, lacerations or fly bites. The bacteria can cause external abscesses anywhere on the body, but mostly in the ventral midline of the belly and the pectoral region beneath the chest muscles. Internal abscesses, found on the liver, respiratory tract, kidney and spleen are less common, but more serious. In fact, up to 40 percent mortality has been reported in these cases, even with treatment. Pigeon Fever causes severe inflammation and local tissue damage. Outward signs of the disease can include anorexia, fever, lethargy, weight loss, respiratory tract infection, abdominal pain, and abortion in pregnant mares. It may appear as a hard lump on the chest, udder or sheath. If untreated, the disease can enter the body internally and cause death. Diagnosing an internal infection is more challenging. Your veterinarian may use serological testing (diagnostic identification of antibodies in the serum), abdominal ultrasound, abdominocentesis (surgical puncture of the abdomen), radiographs, and subsequent laboratory analysis. The blood test is most useful when veterinarians suspect internal infection and no external abscesses are present. It is not uncommon for horse owners to spend thousands of dollars and weeks or months treating a horse with Pigeon Fever. As the concern has grown, so have the efforts to prevent the disease. Boehringer Ingelheim is developing a vaccine called Corynebacterium pseudotuberculosis (Pigeon Fever) Vaccine. It is being designed for horses over one year of age that do not have an active infection. Dr. Robert Hunter will publish an advisory when the vaccine becomes available. In the meantime, horse owners can help stop the infection or minimize the spread of Pigeon Fever. Wear latex gloves when working with affected horses. 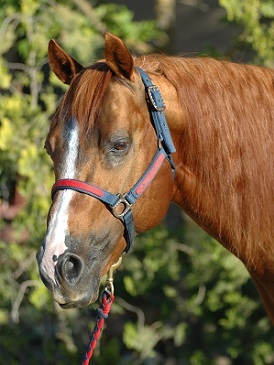 Isolate affected horses to eliminate horse-to-horse contact. Prevent drainage from the infected abscesses from contaminating the soil. Pigeon Fever can live up to 8 months in contaminated soil where flies can pick it up and spread the disease. Use fly control against stable flies, horn flies and houseflies to reduce transmission. Pigeon Fever is not a reportable disease with the California Department of Agriculture, so advisories will not be available if there is an outbreak in your region. The best source will be your local veterinarian who can inform you of local cases and precautions to take based on your horse’s activities and physical condition. Disasters strike with little or no advance notice. For horse owners, it is a nightmare we all dread, having our animals involved in a raging fire, an earthquake, or floods from a powerful storm. So what can you do to prepare? How can you give your domestic animals the best chance possible to survive an occurrence you cannot predict? Emergency workers are not trained for large animal rescue making them unable to help residents who have been told to evacuate areas when fires are approaching or structures are insecure. 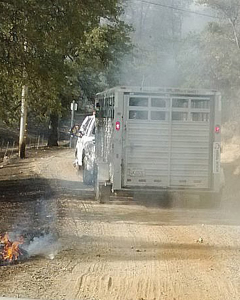 Some communities have large animal disaster response teams that can work directly with their local Office of Emergency Services to rescue horses and other animals affected by a disaster. Does your community have one? Tip: Contact your local Animal Services Department, Police or Sheriff’s office and local veterinarians to determine if a large animal disaster response team exists. If it does, keep their contact information handy and follow their recommended procedures to be prepared for a disaster. If one has not been organized, consider taking the lead to get one started. Find a local Community Emergency Response Team (CERT) that can provide valuable training and credentials to help during a disaster. Visit the website for the North Valley Animal Disaster Group, based in Chico, for ideas. The Center for Equine Health and the School of Veterinary Medicine at UC Davis is committed to supporting and communicating training opportunities for large animal disaster worker certification and integration into your local Office of Emergency Services. Develop A Disaster Plan for Your Ranch – Advance preparation will make it easier to take action during a stressful situation. Create some form of identification for your animal. This can include a microchip, name tag and contact information on a halter or collar. Keep digital photos of your animals in a safe place, such as a cloud service that can be accessed away from home. Be sure the photo shows distinguishing marks, such as a blaze, cowlick or scar. Be sure to have your passwords for your accounts accessible as well! It is possible the internet would be impacted during a disaster. Create a “grab and go” bag that includes hard copies of vital health records for your animals, proof of ownership such as registration papers or a bill of sale, identification photographs, and emergency phone numbers for veterinarians, family members and friends who might provide a safe haven for your animals during the disaster. Keep your horse trailer road ready with good tires, sturdy floor boards and a hitch and electrical plug that works with your vehicle. If you don’t have your own transportation, make an agreement with someone in a close-by community who would be willing to pick up your animals. Make arrangements with another ranch to receive your animals should it become necessary. Tip: If your horse won’t load in a trailer in the best circumstances, chances are slim they will hop in during a stressful evacuation. Practice loading and unloading so that your horse considers the trailer to be a safe place to enter. Know what to do if you are unable to evacuate. Would your horses be better off in the barn or loose in a pasture? If you have a large stable, including one with boarders, post an evacuation plan at the entrance to the barn to ensure those present when disaster strikes know how to help. Evacuate as early as possible, before it becomes mandatory. If you wait until the last minute you may be told to leave your horses behind, often for days without food or care. Have supplies on-hand in case you are unable to get to a feed store. This includes hay, or the animal’s primary source of food, and water buckets. Have a portable first aid kit that you can bring with you in case evacuation is necessary. After you have your disaster plan and supplies in place, reach out to your neighbors to share information and commit to help each other. Use the links below to learn more about emergency response organizations. Hunter Stallion Station is pleased to be a Gold Sponsor at this year’s TrailFest, hosted by the Central Valley Rails to Trails Foundation (CVRTF). The event will take place on Saturday, October 12, from 5pm – 9pm. As it has for the past two years, TrailFest proceeds will primarily benefit Project R.I.D.E.’s therapeutic riding program in Elk Grove. CVRTF was informed that there is a special computer application that can make it possible for autistic equestrians, and riders with limited ability to speak, to communicate while riding using an iPad – so they jumped at the opportunity to make a difference. To that end, CVRTF will purchase an iPad and ProLoquo Software for the Project R.I.D.E. program with TrailFest proceeds. If the event is a huge success – they can purchase two! Learn more about the software here. Please visit the TrailFest webpage and purchase your tickets to this worthy event. You will be well fed and “hydrated” by the 30 vendors who will be providing a taste of locally produced wine, beer and great food! Junior Starlight Will Be At TrailFest! You will also have a chance to guess the weight of renowned Quarter Horse Stallion Junior Starlight who will be on hand to help you win over $500 if you’re the closest! Take a look at this flyer that provides more details. Learn more about Junior here. West Nile Virus (WNV) is transmitted to humans and animals by the bite of an infected mosquito. To date in 2013, West Nile Virus has been detected in 31 California counties. Two recent cases were treated by Hunter Stallion Station Equine Veterinary Clinic that sadly required the horses to be euthanized. Both had unknown vaccination history. For the latest national data, view this USGS map on the U.S. Department of Interior website. On August 16, 2013, the California Department of Food and Agriculture (CDFA) Animal Health Branch confirmed two additional cases of West Nile Virus; a one year old unvaccinated Andalusian colt in Sacramento County and a four year old Morgan mare of unknown vaccination status in Placer County. Both horses are recovering. For 2013, a total of eight (8) horses have been confirmed positive for WNV. The positive horses were located in Kern, Placer, Riverside, Sacramento(3) and Stanislaus(2) Counties. Four of the eight positive horses were euthanized. Please make sure your horses have been vaccinated to ensure maximum protection against the West Nile Virus, and take precautions to protect you and your family as well. The risk of serious illness to most people is low. However, some individuals – less than 1 percent – can develop a serious neurologic illness such as encephalitis or meningitis. People 50 years of age and older have a higher chance of getting sick and are more likely to develop complications. Recent data also indicate that those with diabetes and/or hypertension are at greatest risk for serious illness. In late July of 2013, an elderly resident in Glenn County was the first confirmed human case of West Nile virus infection. The person was hospitalized, but is now recovering. 1. DEET – Apply insect repellent containing DEET, picaradin, oil of lemon eucalyptus or IR3535 according to label instructions. Repellents keep the mosquitoes from biting you. The CDPA states that DEET can be used safely on infants and children 2 months of age and older. 2. DAWN AND DUSK – Mosquitoes bite in the early morning and evening so it is important to wear proper clothing and repellent if outside during these times. Make sure that your doors and windows have tight-fitting screens to keep out mosquitoes. Repair or replace screens with tears or holes. 3. DRAIN – Mosquitoes lay their eggs on standing water. Eliminate all sources of standing water on your property, including flower pots, old car tires, rain gutters and pet bowls. If you know of a swimming pool that is not being properly maintained, please contact your local mosquito and vector control agency. The equine mortality rate can be as high as 30-40%, however, studies have shown that the WNV vaccine has a substantial effect on preventing disease. 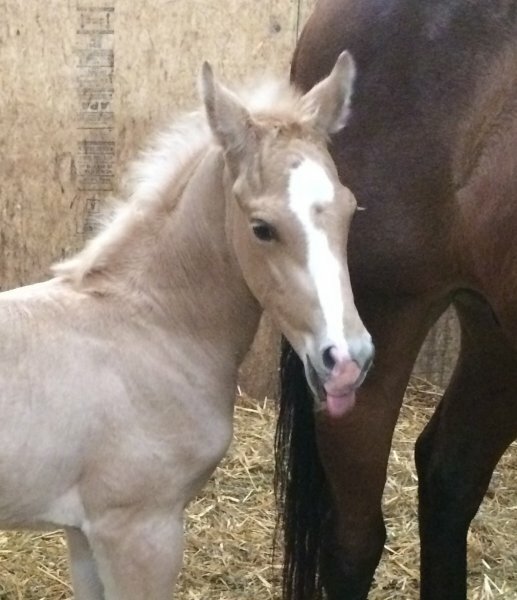 The American Association of Equine Practitioners (AAEP) recommends vaccinating all foals and horses against WNV. Turn off incandescent bulbs inside stables at night and place incandescent bulbs far away from the stables to attract the mosquitoes. Contact your veterinarian today to make certain your horse’s WNV vaccine is current. Taking these precautions will help protect your horse and you! Over the past few years, there has been a lot of interest and research on the benefits of Omega-3 fatty acids for horses because of the proven benefit to humans and other species. Omega-3 fatty acids play a significant role in the growth, development, and overall health of offspring. Fats are commonly used in equine diets to increase the energy density of the diet, but they are also necessary to metabolize important fat-soluble vitamins (A, D, E, and K) and several cellular functions. While omega-3 is commonly found in linseed and flaxseed oils as well as cold water fish, researchers have found that there is a percentage of omega-3 fatty acids in hay and pasture: about 55% of the fat in fresh pasture and 18-35% of the fat in hay. 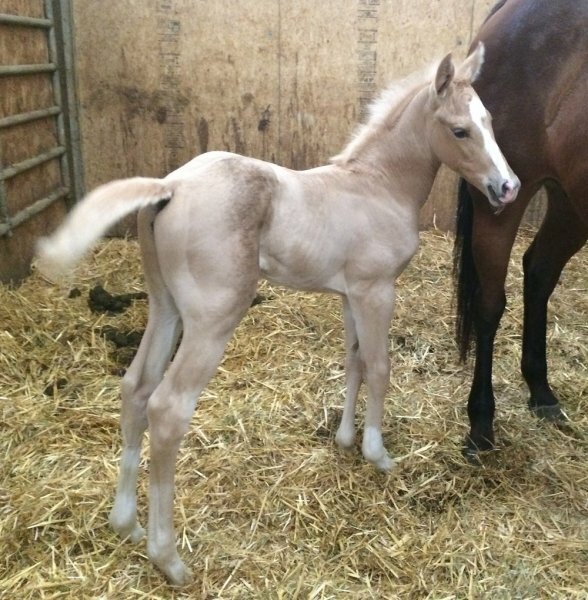 Studies have reported that lactating mares, fed a mixture of corn oil and linseed oil that provided an omega-6 to omega-3 ratio of about 2-to-1, resulted in increased omega-3 fatty acids in the mare’s plasma, her milk and the foal’s plasma. The results suggest that we can improve the fatty acid status of the foal by feeding the mare fatty acids. In similar experiments, mares that were supplemented with a protected fatty acid mixture also produced colostrums that had higher *IgG concentrations, which could have positive effects on the immune system of the foals. These studies suggest that horses may benefit from using fat sources that provide higher levels of omega-3 fatty acids than can be supplied by corn or soybean oil. Fish oil is a rich source of omega-3 fatty acids but it is not very palatable to horses unless processed to remove the fish odor. Linseed oil, or flax seed oil, are rich sources of omega-3 fatty acids and contain a desired ratio of omega-3 to omega-6, making them the best source in horse feeding programs. Always consult your veterinarian during your mare’s pregnancy to be certain she has the nutrition needed to maintain her health, and that of her foal. Contact Hunter Stallion Station Equine Veterinary Clinic for suggestions on sources of Omega-3 fatty acids for your horse’s feeding program. *IgG – Immunoglobulin G, the most abundant type of antibody, found in all body fluids; protects against bacterial and viral infections. Dr. Diane Isbell, DVM, graduated from UC Davis. For over 25 years she has enjoyed Equine Sports Medicine practice. Her interest in ultrasound began before vet school when machines in the early stages where used on the breeding and training farms where she worked. Diane was fortunate to have Dr. Carol Gillis as an instructor in vet school. Dr. Gillis obtained her PhD is in tendon maturation and healing while starting and developing the ultrasound unit at Davis. 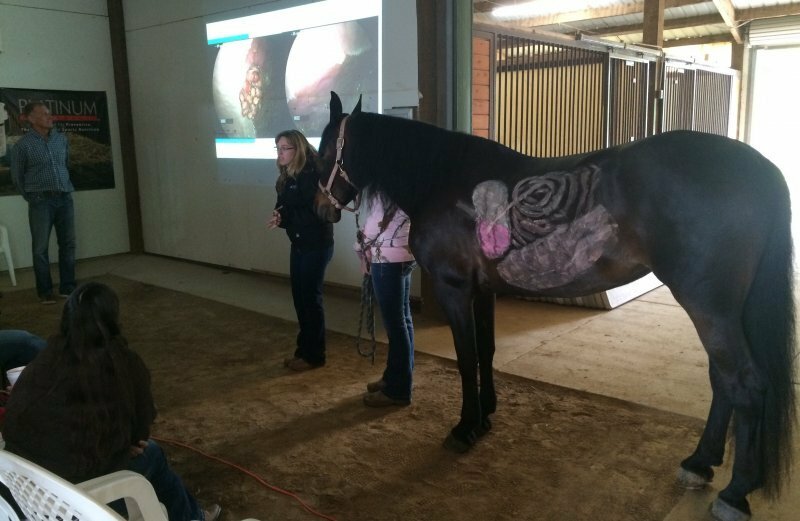 It was her enthusiasm, attention to detail, knowledge and application of ultrasound to every part of the horse’s body that opened Diane’s eyes to the possibilities offered by ultrasound imaging. Over the years, ultrasound has been a driving force in Dr. Isbell’s practice. It’s a rare day that she doesn’t scan several horses. And she scans a wide range of lameness issues ranging from the spine to the foot. Dr. Isbell assists in teaching ultrasound across the country instructing with gifted ultrasonographers such as Dr. Gillis and Dr. Philippe Benoit from France. She has authored “Ultrasound Imaging of the Suspensory Ligament – A Practical Reference Guide” and co-authored “Ultrasound Imaging of the Foot – A Practical Reference Guide”. She also consults for VetImaging, an ultrasound sales and education company. Dr. Isbel will be a presenter at the March 23 Horseman’s Day at Hunter Stallion Station. 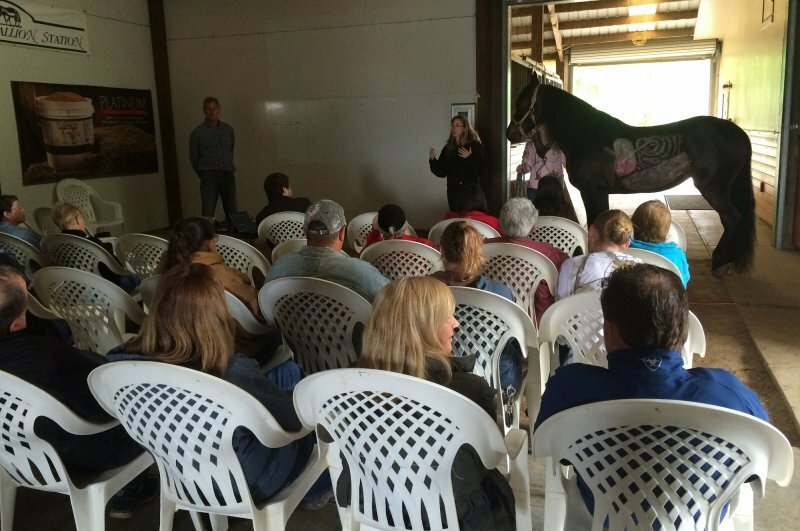 Her topic will be Ultrasound – You and Your Horse’s New Best Friend! Sign up for this free event and enjoy other speakers and a tri-tip barbeque. Stash will be a presenter at the March 23rd Horseman’s Day at Hunter Stallion Station. His topic will be Choosing the Feed Program for Your Horse. How did you determine the type and amount of feed for your horse? If you have more than one, are they all being fed the same even though they may differ in size, breed, age and use? 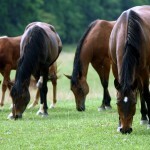 Should the performance horse be provided with the same nutrition as the broodmare? Creating a feeding program requires a knowledge of nutrient requirements and an understanding of the composition and use of common feeds. The individuality of horses and their behavior should be taken into consideration along with the need to maintain the proper body condition, and obtain maximum performance. The ration should be formulated to meet the nutrient requirements for the appropriate physiological state of each horse. Stash Easton grew up on a quarter horse ranch in Modesto, California. He was exposed to all aspects of the industry including raising, training, breeding, conditioning, and sales of quarter horses. 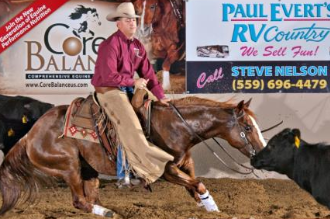 Stash began showing cutting horses in college, while getting a degree in Business Management at the University of the Pacific and continues to show when time permits. Stash worked as an Equine Specialist with Purina Animal Nutrition, LLC from 1999 thru 2012. As a sales representative of Purina, he worked with large commercial equine facilities; trainers; breeders; veterinarians; and feed dealers on the topics of equine nutrition and nutrition management. In 2010, Stash returned to school and earned a Masters of Business Administration degree from Saint Mary’s College of California, and in January of 2013 he began a new role as Marketing Manager for Equine. This presentation will lead off the Horseman’s Day program, starting at 11:00 am. Learn more on the Hunter Stallion Station Events page, where you can sign up to attend.